Passive low-e coatings are ideal for very cold (or heating-dominated) climates because they allow some of the sun’s short-wave infrared energy to pass through and help heat a home during the winter, while still reflecting the interior long-wave heat energy back inside. 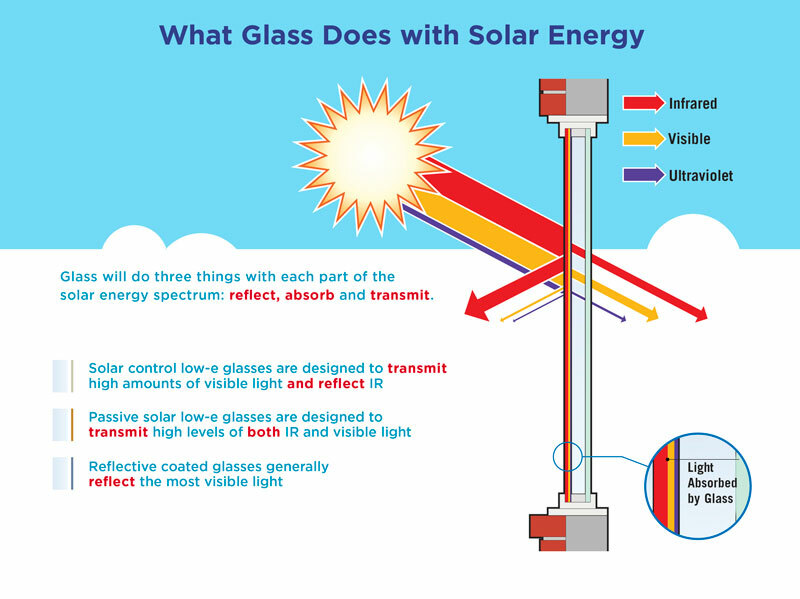 This energy from the sun comes into the house in the form of short-wave infrared energy, which is transmitted through the glass and absorbed by the floors, walls, furniture and people inside. This energy is then re-radiated by the floors, walls, etc., as long-wave infrared energy or heat. Homes in heating-dominated (cold) climates lose interior heat to the outside colder-temperature environment. Heat loss continues as long as the exterior temperature is lower than the interior temperature, regardless of whether it is day or nighttime. Many colder climates have weeks or even months during which outside temperatures are significantly colder than most preferred interior temperature levels. Most passive low-e coatings are manufactured using the pyrolytic process. The coating is applied to the glass ribbon while it is being produced on the float line. The coating then “fuses” to the hot glass surface, creating a strong bond, or “hard-coat” that is very durable during fabrication. Finally, the glass is cut into stock sheets of various sizes for shipment to fabricators. The Sungate® glass family by Vitro glass features a proprietary passive, low-e coating technology designed for heating-dominated climates that provides high performance and helps to lower heating costs.